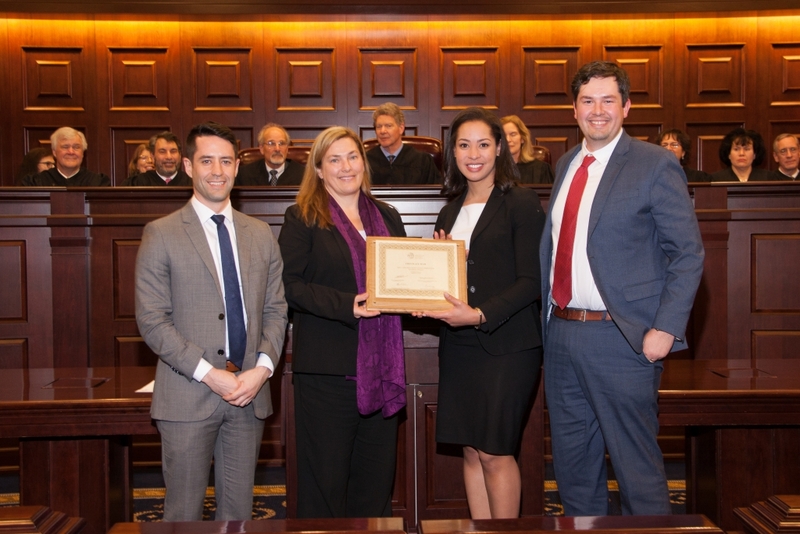 Briana Falcon, second from right, and Joe Heaton, right, are presented the Lefkowitz National Trademark Law Moot Court Competition championship. LSU Law students Briana Falcon and Joe Heaton were crowned national champions of the Lefkowitz National Trademark Law Moot Court Competition at the U.S. Court of Appeals for the Federal Circuit in Washington, D.C., on March 17. Falcon and Heaton, both from Baton Rouge, took home the First Place Team award, along with awards for Best Oralist Team and second place Best Brief at the competition. The LSU Law Lefkowitz Trademark Law Moot Court team is coached by Professor Lee Ann Lockridge and Advocacy Fellow Annie Scardulla. LSU Law swept best brief, best oralists, and first place in February at the Dallas regional rounds, and faced off against the other 11 national finalists over the weekend in Washington, D.C.
Eighty teams from law schools across the U.S. participated in the Lefkowitz Moot’s regional rounds this year. The Lefkowitz National Trademark Law Moot Court Competition is sponsored by the International Trademark Association (INTA).